Recently, I took some of my former Boston Architectural College students with me on a tour of the California Paints color center and manufacturing plant in North Andover, MA. 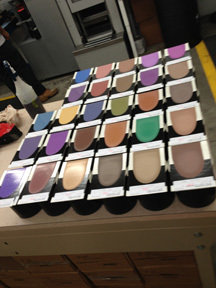 As a teacher and Architectural Color Consultant, I went because I think it’s helpful to see first-hand exactly how paints are made today, since that can effect how colors are applied, and to be knowledgeable of products’ capabilities from various makers. I also had never toured a paint-making facility, and neither had my students, so we were quite intrigued. My group was greeted by Dan Fitzgerald, Architect & Design Rep., and Kristin Summer, Color & Design Strategist. They opened our tour with a meeting to cover the basic principles of paint and to address any questions. California Paints is now featuring their new colorant system, Trillion, which scrubs clean better than most paints and has an increased opacity, which means it covers better. Dan and Kristin clarified the various types and advantages of acrylics – my preferred type of base – and explained how their color pallets work, then introduced us to their collections of historical colors. I found it fascinating because, in the end, it all affects the color. 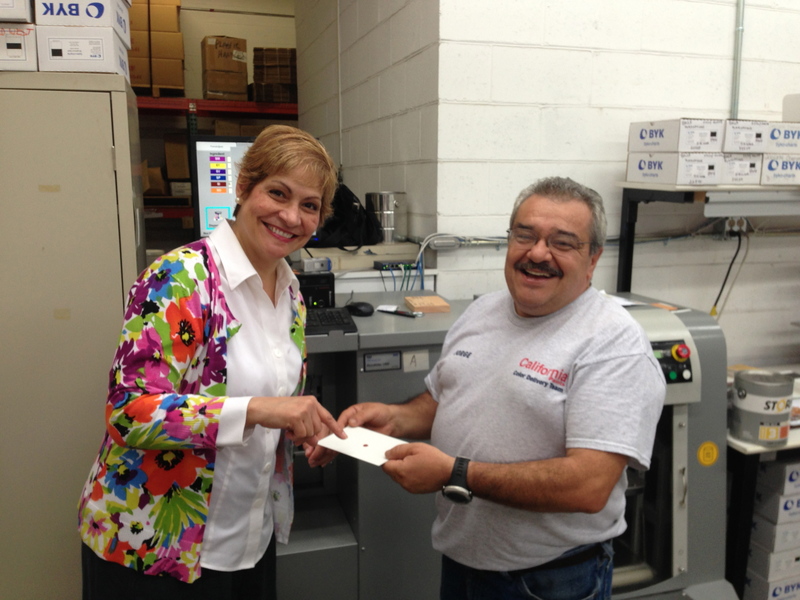 During the tour, we were introduced to Jorge D’Ascensao, Color Delivery Manager. It’s his job to check for color accuracy. I was impressed with his ability to discern even the most minute differences between two colors. His ability to translate colors with such ease was downright inspirational; so much so that I asked if I could spend a couple of hours with him later to talk color. I was delighted that he said yes!!! It was also enjoyable listening to his enthusiasm as he explained how today’s technology can calibrate and dispense even the smallest amount of colorants accurately. Every year, I spec hundreds of colors, and color combinations, for my clients’ homes and businesses. But I also spec specific paints for their ability to hold those colors, endure clients’ environments, and keep looking the way I have recommended for years to come. Touring a paint manufacturer reinforced for me all the work, research, and effort involved in producing those products I spec. I was impressed by the enormity and facets of the facility, and grateful for the information they shared. Our tour was informative and enlightening, and any Architectural Color Consultant who wants to genuinely understand why paints you spec perform the way they do would benefit from the experience. And so would your clients.